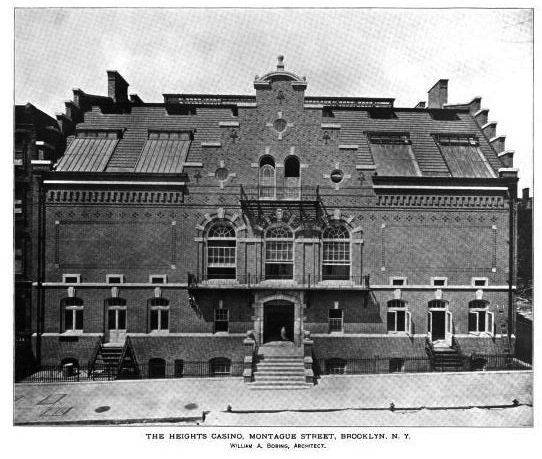 The Heights Casino designed by William A. Boring c. 1905 at 75 Montague Street in Brooklyn, New York City. The social club housed multiple indoor tennis and squash courts. Click HERE for more on the Heights Casino on Brownstoner. Click HERE to see the building on google street view. Photo from The Brickbuilder, 1905. William St. featured in this week's 'Streetscapes', designed by CPH Gilbert. Does "casino" have an original meaning that goes beyond gambling? I've never seen it used this way to mean a social or athletic facility. Ok, I just answered my own question by using dictionary.com. The meaning of casino is any building which is a social gathering point, but especially if there is gambling. The word comes from the Italian for house (casa) and the diminutive ending (ino). Never knew this, but it is so obvious now. Nice to see CPH Gilbert's landmark commercial buildings get some well deserved attention. The Brooklyn Heights structure looks to be remarkably intact. A great building in an equally great Brooklyn neighborhood.